Howell homes for sale, search for your new home in Howell. Call 732-598-7700 to see the homes in Howell. You’ll find that the homes in Howell begin at the starter level range, however,recently homes have sold for more than $600,000. Smaller homes are available, as well as large luxury homes, along with every style of home in between. Also a large number of the homes in Howell are condos. Most of the Howell homes are single family homes, also there are ten condo complexes and three active adult communities. 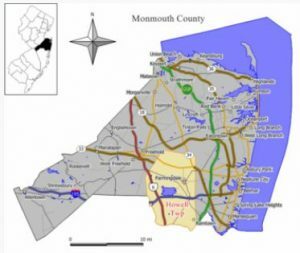 Howell is located at the southern end of Monmouth County and was formed in 1801 when territory was taken from Shrewsbury Township. Initially Howell included what are now the towns of Wall, Brick and Lakewood among others. Howell was named after Richard Howell, New Jersey’s third governor. The Manasquan River was a major transportation route, and roadways were built to connect farms with the Manasquan River for transportation of goods. The roadways which are now Route 9 and Route 33 were based upon old Lenape Indian trails. Stagecoach service started in the 1850s along Route 524, which is still called Stagecoach Road in some areas. Early industry in Howell included an iron works company and brick production, in addition to agriculture, marl (an early form of fertilizer) and poultry. Monmouth County was the leading egg producer in the country during the 1930s. In fact, a major egg producing facility is still in operation in Howell. Naval Weapons Station Earle is partly located in Howell. The 2010 Census reported 51,000 + people living in homes in Howell. Howell has over 17,000 households, with a median income of $89,287, also the per capita income was $35,489. The northern section of Howell has a Freehold mailing address. Howell Township has 12 schools in their school system. Nine are K-5 while three are grades 6-8. When entering high school, children from Howell homes will attend the Freehold Regional High School District. The Freehold Regional High School District consists of six high schools. Children will attend the high school according to boundaries set by the district. Most, but not all, will attend the school in their town. Each of the six high schools has specialized Learning Centers and any student from the region is eligible to enroll. However, enrollment is a competitive admission process. There are many private schools in the area also. Call 732-598-7700 today to see Howell homes for sale or homes in Howell.